Figure 9.2. Protection of mRNA by the bacterial ribosome. A: Nucleotide residues protected by the 70S ribosome or the 30S ribosomal subunit with initiator tRNAfMet against chemical modifications and enzymatic attack (similar results have been obtained for the 30S ribosomal subunit with tRNAPhe). A weaker protection of the 5'-portion of the protected region is shown by dotted underlining. 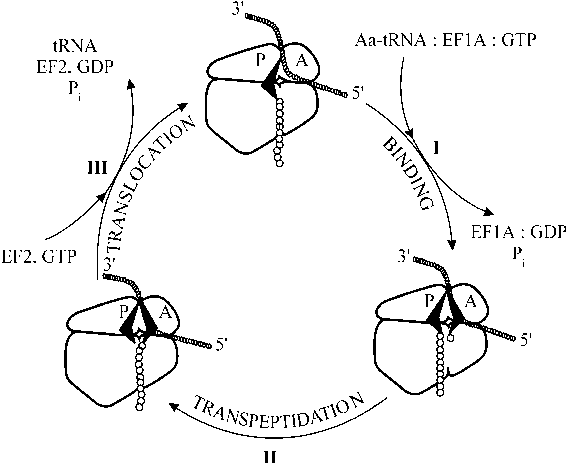 B: Schematic representation of the protection of the ribosome-binding site of mRNA by the 30S ribosomal subunit in the presence of codon-interacting tRNA (the initiator tRNAfMet interacting with initiation AUG codon is shown). C: Schematic representation of the protection of the ribosome-binding site of mRNA by the 30S ribosomal subunit in the absence of tRNA. (Reproduced, with modifications, from A. H.ttenhofer & H.F. Noller, EMBO J. 13, 3892-3901, 1994, with permission). considerable length of the mRNA-binding site suggests a multicenter binding of mRNA to the particle, i.e. the participation of several binding points of the ribosome surface. The position of two mRNA codons interacting with anticodons of both substrate tRNAs, i.e., the decoding center of the small subunit, is of especial interest. Of the proteins either belonging to the mRNA-binding site of the 30S ribosomal subunit or located nearby, proteins S1, S3, and S5 can be most reliably identified in this way, although at least a dozen other 30S ribosomal proteins have also been reported. On the basis of evidence for the interdomain or interlobe position of proteins S3 and S5 (see Chapters 7 and 8), one may suggest that the mRNA-binding site is located in the region of the grooves dividing the head, the body, and the side bulge of the 30S ribosomal subunit. Protein S1 also appears to occupy an interlobe position being localized rather on the external surface of the small subunit, in the region of the "neck". Its intrinsic capacity for forming complexes with polynucleotides has been detected. The binding of isolated protein S1 with RNA results in the loosening or unfolding of the RNA secondary structure. Taking into account that protein S1 neighbors mRNA on the ribosome, one may assume that it directly participates in the formation of the mRNA-binding site. Protein S7 located on the 30S subunit head, near the "neck", but on the side opposite to that with protein S3 (see Figs. 8.3, 8.5 and 8.7), is also sometimes mentioned among components adjacent to the mRNA-binding site. 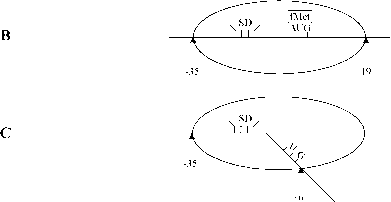 Figure 9.3. 16S rRNA regions involved in organization of the decoding center of the E. coli ribosome. Cross-linking sites are shown by arrows. Nucleotides indicated by bold letters are highly conserved in evolution. Footprint sites from P-site-bound tRNA are indicated by filled circles, and those from A-site-bound tRNA by filled triangles. SD-antiSD complementary interactions are shown by dash lines. (Based on the data summarized in F. Mueller & R. Brimacombe, J. Mol. Biol. 271: 566-587, 1997). (1) The polypyrimidine 3'-terminal region (positions 1535-1541) that has been proved to participate in the formation of complementary complex with mRNA polypurine sequence (Shine-Dalgarno, or SD sequence) located upstream of the initiator codon at the distance of 5 to 12 nucleotide residues (see Section 15.2.2). This 3'-terminal sequence of the 16S rRNA is sometimes called "anti-SD sequence". (The anti-SD positions of the 16S rRNA are connected with the SD sequence of mRNA by dash lines in Fig. 9.3). (2) The 16S rRNA regions that interact with the spacer between the initiation codon and the SD sequence of mRNA. 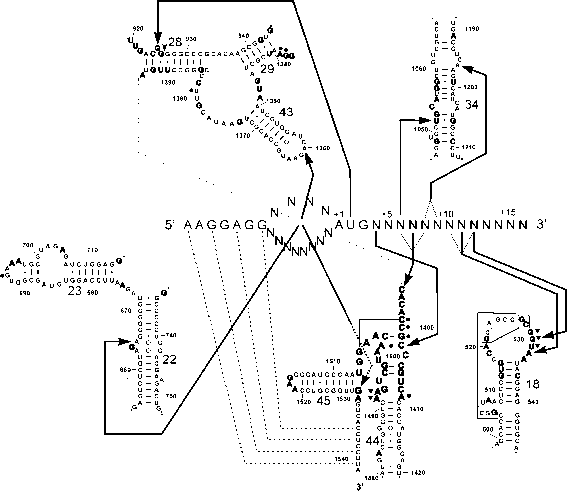 They include the 16S rRNA region just adjacent to the anti-SD-region (particularly G1529), the nucleotide A665 and the nucleotide A1360 (they are indicated by long arrows in Fig. 9.3). The nucleotide A665, located at the protein S15 binding site, interacts with an mRNA spacer sequence only at the first stage of initiation of translation, and its contact with mRNA disappears when the initiator tRNA binds to the P site (see Section 15.2.2). On the contrary, the nucleotide A1360 is in a contact with an mRNA spacer region only when the initiator tRNA occupies the P site. It is localized at the binding site of protein S7 that may also participate in the organization of the decoding center.